Jonathan Lethem has been cultivating under "an umbrella"… "ideas about identity, culture, history, cities, and loss" since 1999’s Motherless Brooklyn, Daniel Hamilton writes in this review for Fanzine. 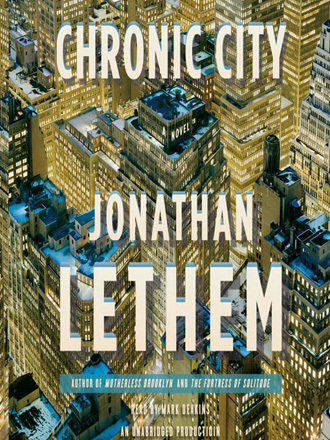 Chronic city, Lethem’s latest, is "a story about storytelling", one that unloads a giant gobstopper of a plot in the author’s most postmodern novel to date. Hollywood has responded to the economic crash with the lightning quick reflexes of a short-selling day trader: swapping glitz and glamour for a hint of class consciousness with recent films like Public Enemies, The International and Sam Raimi’s Drag me to Hell. Stephen Soderbergh, on the other hand, is at least four movies deep in his own immersive and idiosyncratic investigation of the ways economic systems damage both the winners and the losers. Soderbergh refuses to demonize his corporate lackeys and instead de-glamorizes the system in which they participate through his depiction of gold tinted frames, fluorescent lighting and Marvin Hamlisch’s brilliantly kitschy soundtrack.